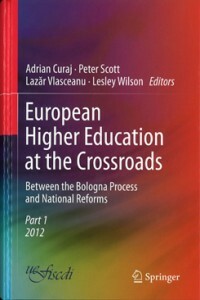 The Executive Agency for Higher Education, Research, Development and Innovation Funding (UEFISCDI), together with the National University of Political Science and Public Administration (SNSPA), the Romanian Ministry of National Education (MEN) and the Ministry of Research and Innovation (MCI) will jointly organise the third edition of the” Future of Higher Education – Bologna Process Researchers’ Conference” (FOHE-BPRC3), in Bucharest, Romania on 27 – 29 November 2017. The conference is part of the European Higher Education Area (EHEA) official calendar of events and conferences, promoting and sustaining the development of EHEA. It aims at providing a unique forum for dialogue between researchers, experts and policy makers in the field of higher education. 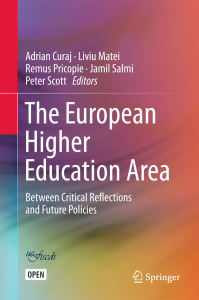 The first edition of this event (October 2011) resulted in a two-volume collection of research articles that framed the research development on topics of high interest for advancing international cooperation in the field of higher education and further evidence-basing the EHEA. The online version of this two-volume book was among the most downloaded 25% Springer publications. 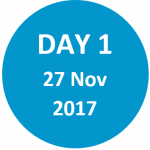 The articles which resulted from the second edition of the conference (November 2014) were made available in open-access format on Springer website. As a result, the publication was in the top 3 most downloaded publications. As the conference has reached its third edition, the organisers have already started the dialogue with Clarivate Analytics (previously Thompson Reuters) for indexing the conference. The Executive Agency for Higher Education, Research, Development and Innovation Funding (UEFISCDI) together with the National University of Political Science and Public Administration (SNSPA) and the Romanian Ministry of National Education (MEN) will jointly organise the third edition of the “Future of Higher Education – Bologna Process Researchers’ Conference” (FOHE-BPRC 3), in Bucharest, Romania on 27 – 29 November 2017. 3. Twenty years of Bologna and a decade of EHEA: what’s next? Following the open call for authors, published on the official website, the Editorial Board will selected approximately 30 papers that will be presented at the conference and further published in a research volume, this being part of the background documents of the 2018 EHEA Ministerial Conference in Paris. Participation in the event is open for all those interested, within the limits set by logistic capacity . No participation fee is required and additional registration details for this category of participants will be available at the beginning of September 2017 on the official website.